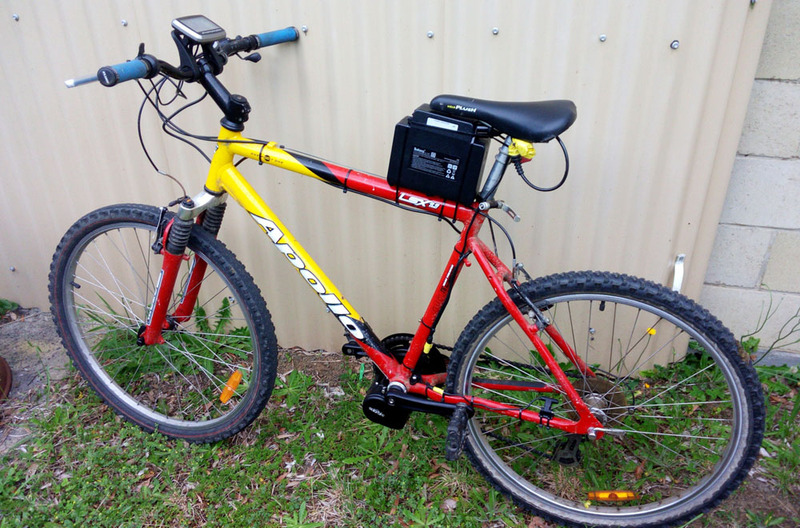 SOLAR BIKE - SOLAR BIKE is an Australian Electric Bicycle Conversion Kit Supplier. Electric Douze Box Bike. April, 2019. 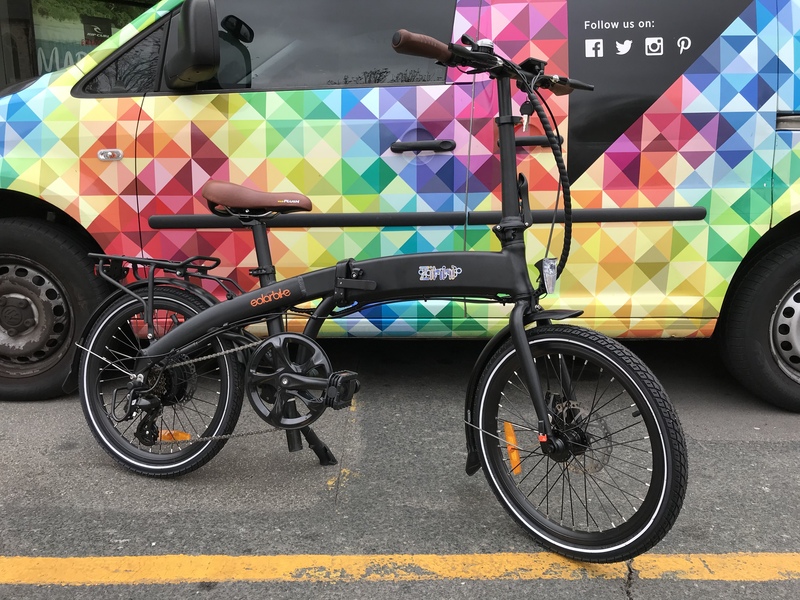 There are an increasingly varied range of box bikes available but the best one that we’ve electrified and test ridden is the French model called the Douze. It’s the best handling model of all – but damn you pay a premium for it. What makes this bike stick out from the rest is 1) light weight, 2) the steering mechanism – it has had the best French engineers work on and it works a treat and 3) in our opinion the low basket and seat contributes to the handling. It all sits close to the ground so the centre of gravity is optimised. Electrifying the Douze isn’t too easy but it’s not that difficult either once you know the trick. We have 3 different types of mid-drive kits and the only one that we could make work was the Bafang mid-drive kit. This is because the space in the frame is limited. The Bafang kit is a very popular kit; it’s extremely reliable and widely available. There is one small trick to getting it in though; you need to actually pull the motor apart and then re-assemble it in place -it’s actually quite easy, just 4 or 5 bolts either side then you can bend the motor enough to slide it into place. 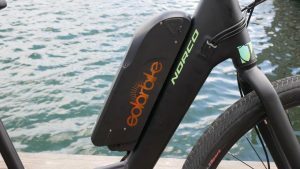 Now, the next thing you need to know before you read any further and are interested in an electric box bike is the price. This thing costs more than an average bike mechanic can save in a couple of years. 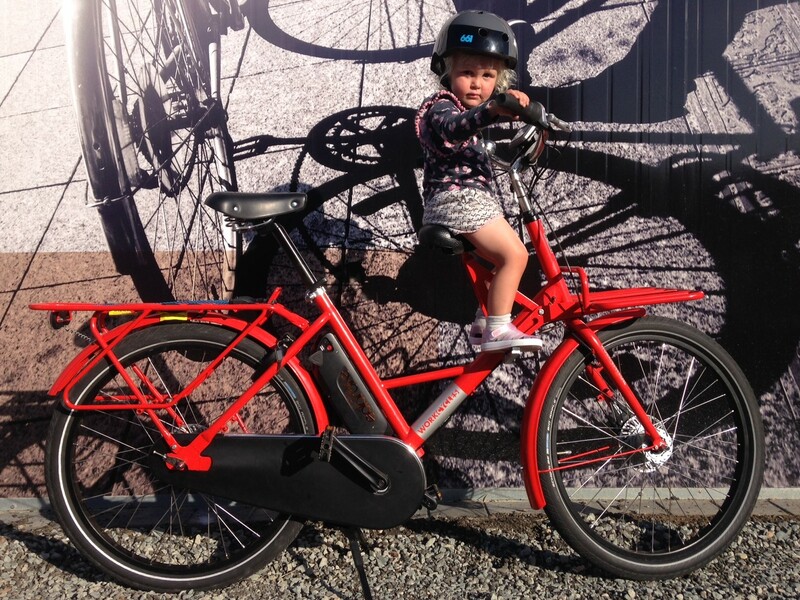 The bike itself is imported by a company based over East called Dutch Cargo Bikes and will set you back around $5000, you’ll then get stung another $1000 for the baby seat and seat belts. Then, unless you are a fitness freak and are happy pedalling all by yourself you’ll likely want to bring it to us to electrify. The kits and batteries required for this system will sell for between roughly $1300 – $2000 depending on motor and battery combination needed. So, all up you’re not going to have much spare change from $8000! 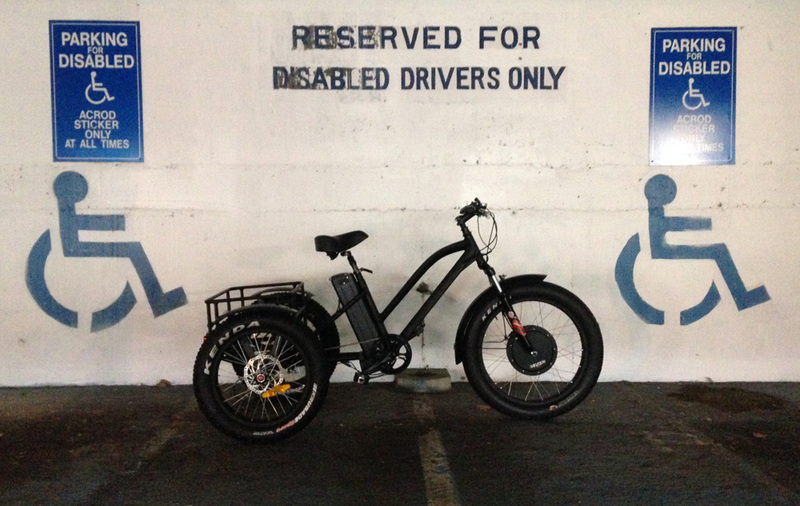 But you’ll have the best electric cargo bike on the market! 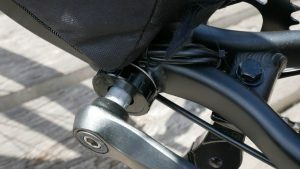 If this sounds like about 2 or 3 times more than you’re willing to pay for such a functional bike then we recommend taking your dollars to our competitors at South Beach Cycles, they have a great range of cargo bikes and box bikes that are potentially more within your budget and highly functional too. 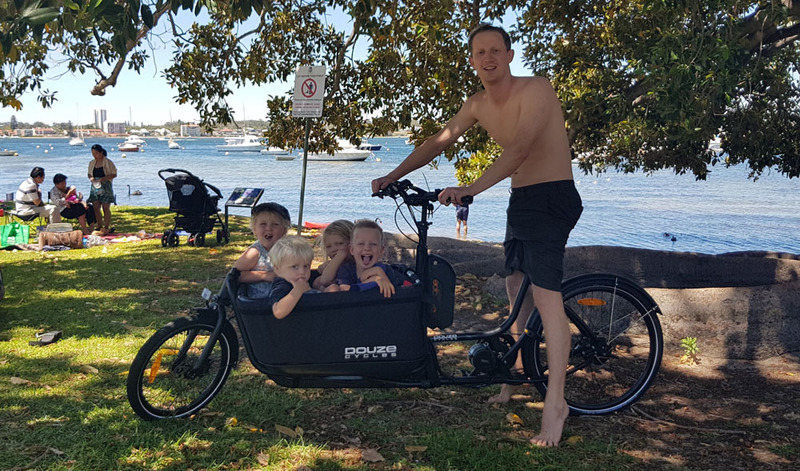 “You couldn’t wipe the smile off his face!” -Amy, Solarbike customer; re her husbands first electric cargo bike experience. We received some feedback and a couple of images from a customer of ours. They had recently just converted this Bakfiets Cargobike with one of our electric bicycle kits. Bakfiets are the safest way to transport your children on a bicycle according to ADAC. 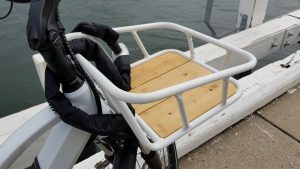 Their concept of carrying children in a cargo bike was innovative and is now accepted world-wide as an alternative and green form of transport. For many parents using a Bakfiets.nl Cargobike is a liberating and life changing experience especially on the school run and condensed urban areas. Since the first model there has been continuing development to allow you to carry babies, children, dogs, shopping and cargo with ease and in safety. Electrifying one of these kits is a fantastic option to help carry the extra weight that the Bakfiets allows you to carry. 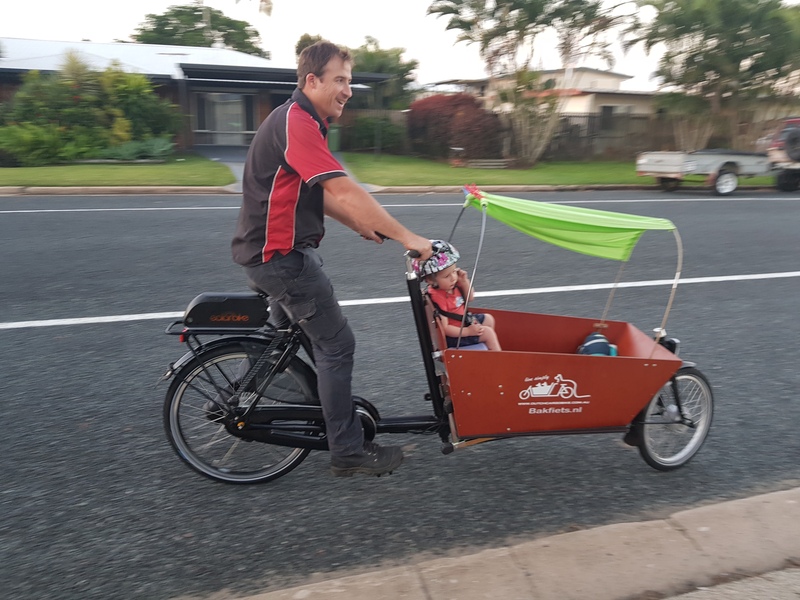 This customer test rided the Bakfiets with a 40km round trip to the beach and back with his son comfortably seated and wearing a safety belt in the front. Interested in electrifying a cargo bike or bicycle? Come in and chat to one of our friendly staff today and explore your options! Powerful, stylish and robust the Dreadnought is our premium off-road model, equipped for extreme terrain from sand to snow. Combining premium components with the most powerful electric system we have in house, the Dreadnought is one hell of a ride. 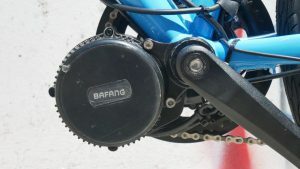 The new BAFANG 1000W mid-drive Ultra torque sensing mid-drive motor. 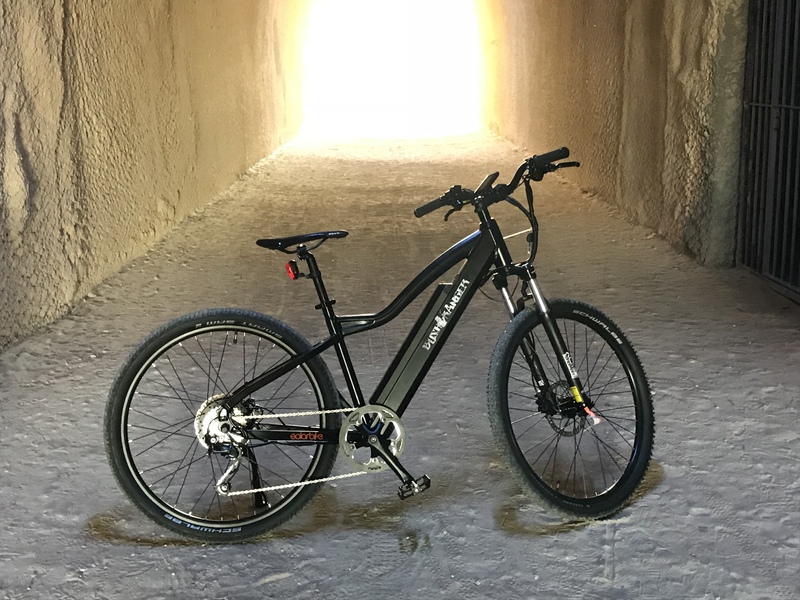 It boasts high volume Kenda 26″x4″ tyres, Mozo suspension forks, Tektro hydraulic disc brakes, a top of the range LG 48V 17.5Ah lithium ion battery integrated into the down-tube and a SHIMANO Alivio 9 speed gear system. 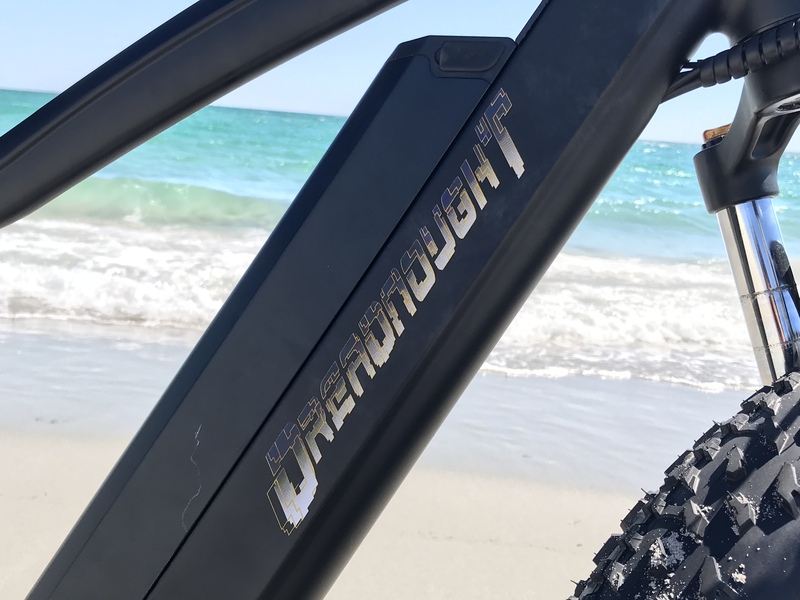 Being an absolute beast of a bike with a 1000W motor, the Dreadnought is strictly an off-road model. Take it out bush, down to the beach or on some fire trails and you’re bound to have a blast! 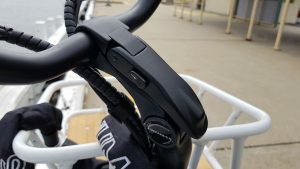 Both throttle and Pedal Assist Systems make it easy to ride for anyone regardless of skill, experience or fitness levels. 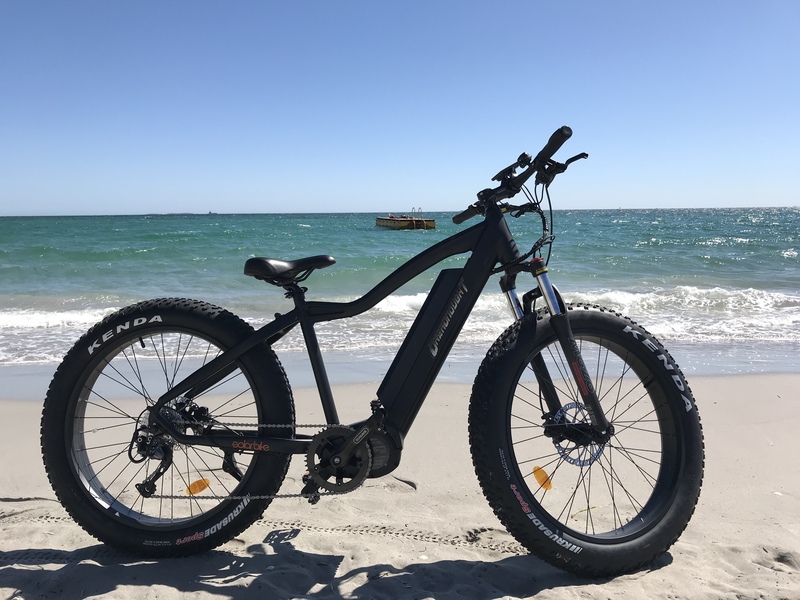 Come and see us at our Fremantle store to check one of these machines out or arrange a test ride on one today for an experience you will never forget! 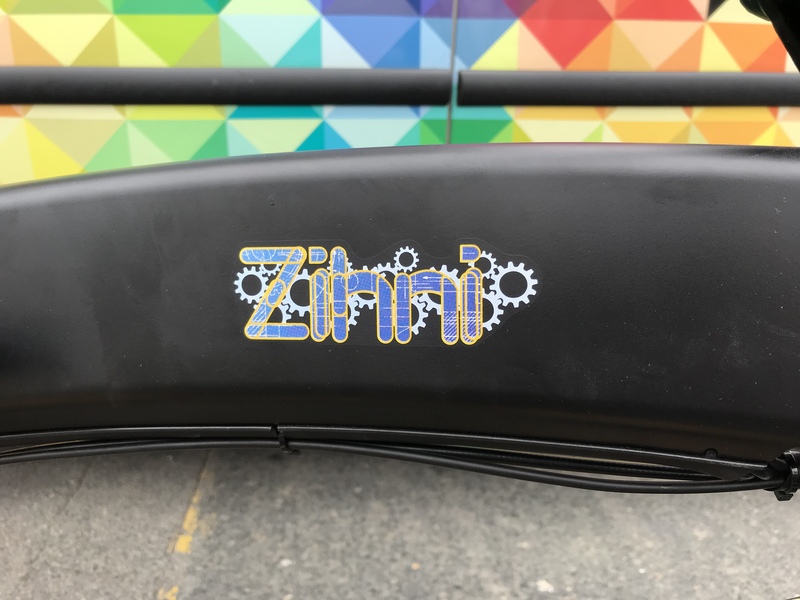 The Zihni from Solarbike is our electric folding bicycle. This elegant design has the battery cleverly tucked away in the main tube of the frame. It is designed for comfort, elegance and convenience. Perfect for Camper Vans, Caravans or even just someone who doesn’t have much space. Zihni is truly the master of small spaces. 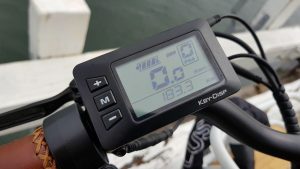 It’s features include integrated front and rear lights powered by the main battery and operated from the LCD display on the handlebars, Shimano 7 Speed gears, Tektro mechanical disc brakes and both throttle and pedal assists systems. 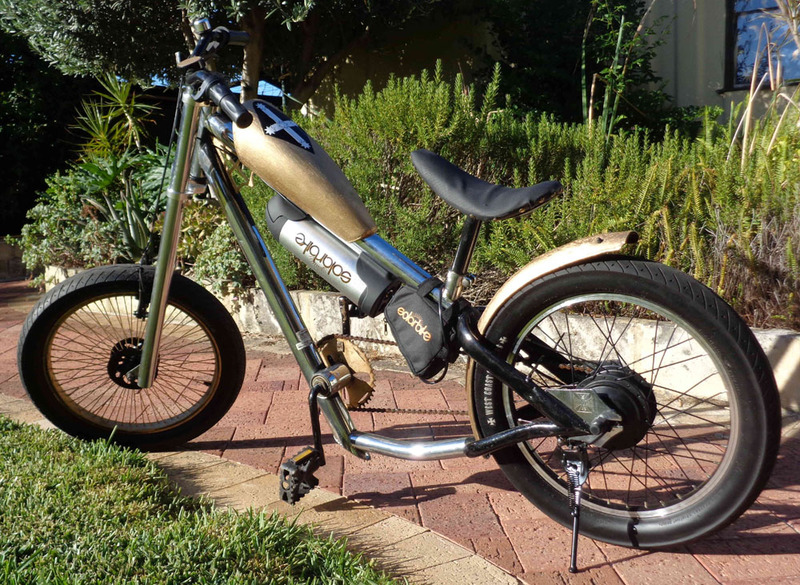 Electrified with a 250W Bafang rear hub motor, powered by a 36V 10.5Ah Samsung battery. The Zihni packs a suprisingly powerful punch for such a small bike. The BUSH RANGER is designed to handle all kinds of conditions from the city to even the harsh Australian outback. 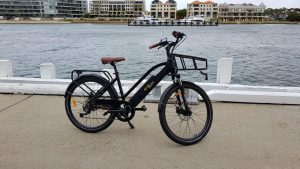 Whether you’re riding it in the city, to the beach, or out in the bush the Bushranger always offers a reliable, comfortable ride. From fire trails to the hustle and bustle of the city’s streets, the BUSH RANGER is equipped for every situation. 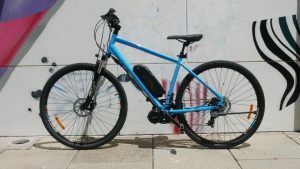 Its key features include a high capacity 36V 14.5Ah Panasonic Lithium-Ion battery integrated into the frame for excellent range and superior weight distribution, a BAFANG rear hub motor, front and rear hydraulic disc brakes and a 9 speed SHIMANO drivetrain for seamless shifting performance. All components are oriented towards robustness and dependability making the Bushranger a versatile all-rounder that won’t let you down, no matter the conditions. Finally, its sleek alloy frame finished in matte black with alloy details and an iconic Ned Kelly motif emblazoned on the side. It’s sure to turn a few heads while your cruising around. We often get asked in the shop about the difference between cadence sensors and torque sensors. 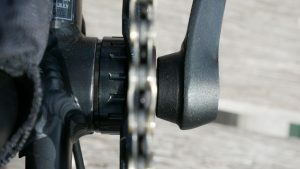 Nearly all hub motors have what is called cadence sensing, that means that the motor is activated with revolutions of the crank; you need to pedal about half a turn before the motor gets activated. The system is very robust and is the most popular system on the market but its main downfall is when you are stationary and need to start pedalling up a hill. Because you need to do the first revolution unassisted it can be difficult because of the hill and the extra weight. Torque sensing systems come standard on nearly any high-end mid-drive motor like the BOSCH or SHIMANO system and they differ in that the motor is activated by pressure, as soon as you push on the pedals the motor is activated. 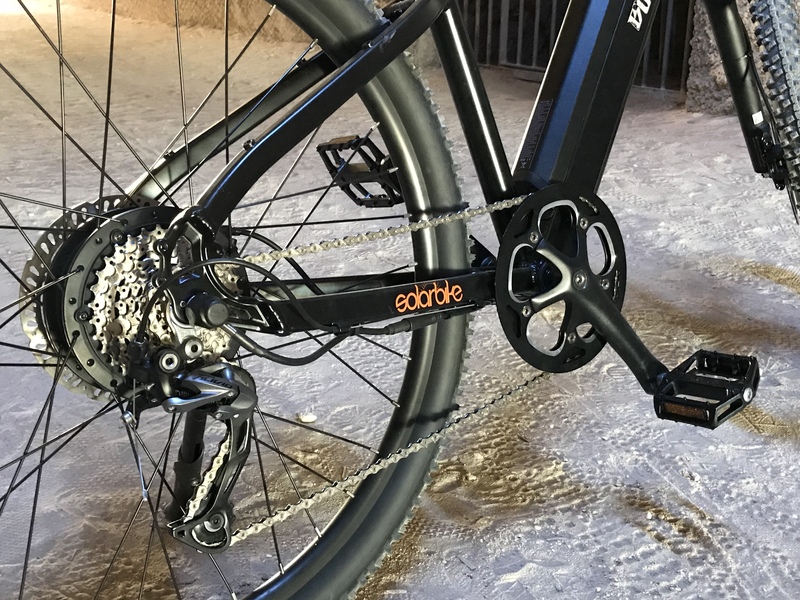 This system is superior due to the more instantaneous activation of power and higher levels of feedback from the sensor providing a smoother riding experience. For the last few years we’ve been trying different torque sensors to work with our hub motor kits and we’re finally pleased to be able to supply the market with one. 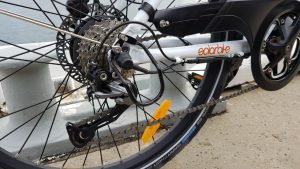 The system is a touch on the expensive side, adding $350 to an existing hub motor system, but it does provide great pedal assist activation. 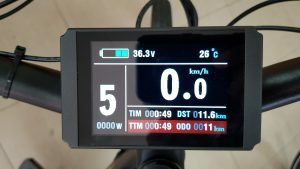 The kit comes with a variety of parts; a bottom bracket torque sensor, an LCD display, cables, front chain ring, front and rear lights, throttle and a controller. 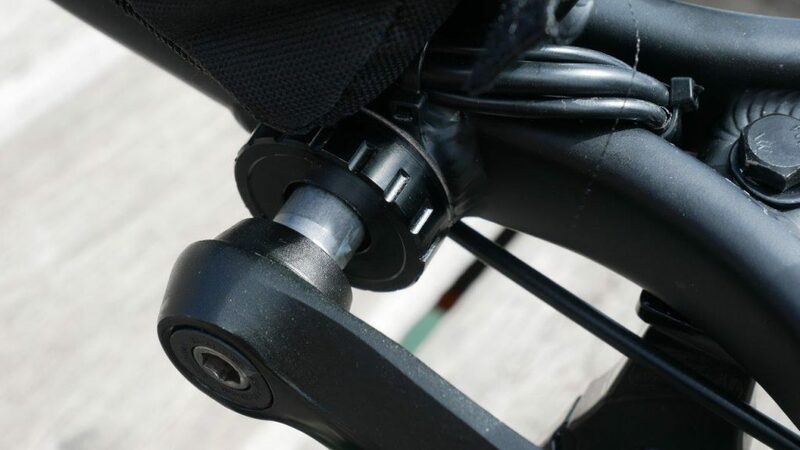 Installation requires a little more work than usual because you have to remove your existing bottom bracket and fit the new one, you also need to drill a hole around 5-10mm in the bottom of the frame to allow the cable from the sensor to exit the frame. 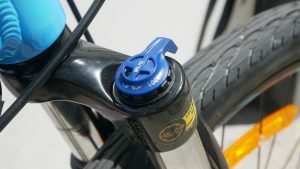 This system can be retro fitted to any electric bike with a hub motor. Please click here to see dimensions, specifications and some basic installation instructions of the torque sensor. Click here to see instructions for programming the LCD display. 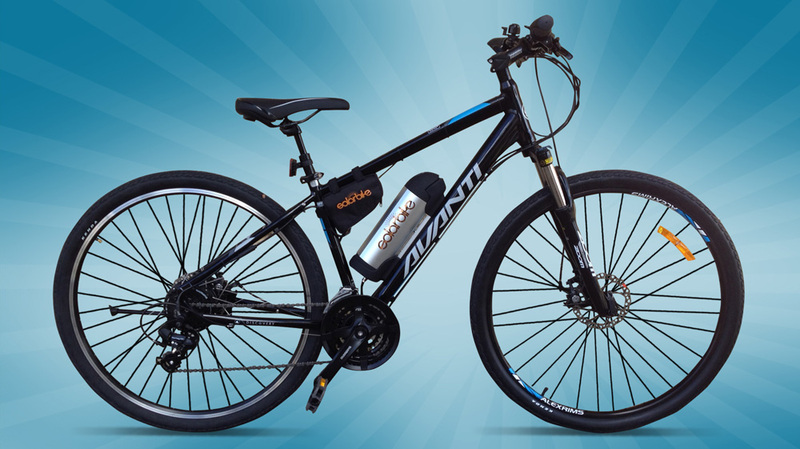 The Avanti Discovery 2 Hybrid Bike fitted with Bafang Mid-Drive 250watt motor and 36V 14Ah Panasonic battery is performance at an affordable price. With its strong 6061 Aluminium frame and chrome alloy suspension fork, it’s more than up to the rigours of everyday use. 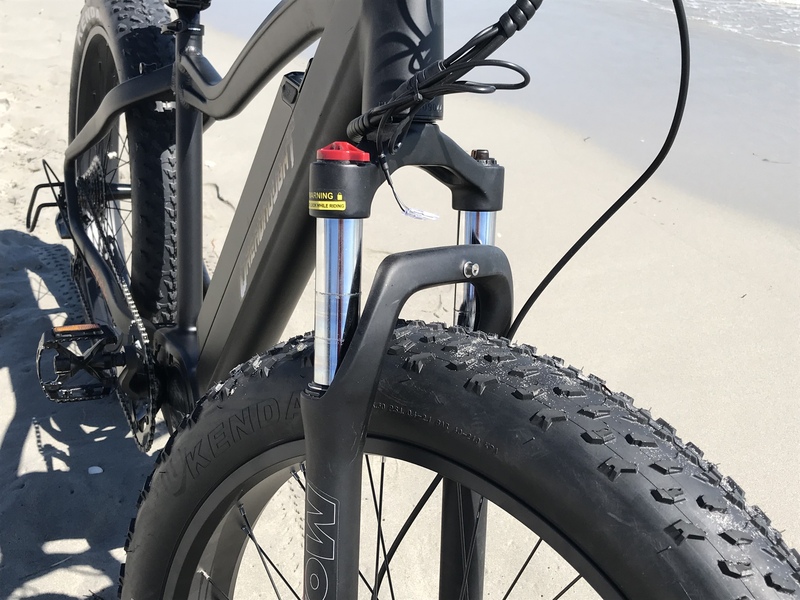 The suspension fork has a lockout feature to smooth out riding on or off-road. With a Shimano 24 speed drivetrain, it gives you a wide range of gears to work with going up the climbs or into the winds. The wide tyres are great for a little bit of off road use, but mainly give great control for commuting in the city. 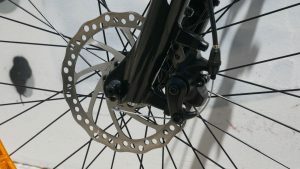 Also, the Tektro mechanical disc brakes offer dependable and superior braking in all conditions. We have fitted the Avanti Discovery 2 with our Electric Conversion Kit allowing for an easy and fast ride. 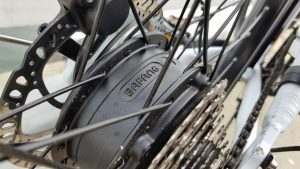 The 36V 14Ah Battery gives you a decent range for the price point and the Bafang 250watt Mid-Drive motor with cadence based pedal assist gives you a great boost as you pedal. 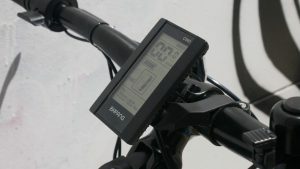 This model comes with an integrated display monitor with a readout on battery level, speed and distance among other things. 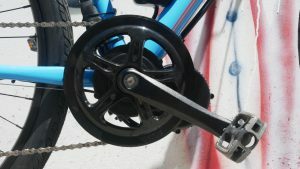 Choosing between Mid-Drive and Hub Motors simply comes down to personal preference but explained in short; Mid-Drives have better weight distribution as the motor is located right on the bottom bracket, whereas with hub motors, the weight is added at either end of the bike, which can alter the handling balance of the bike. Oftentimes, however, these differences are seen as reasonably minor. 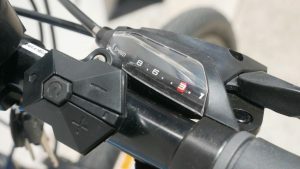 You can use the electric throttle or pedal assist depending on your suits you. 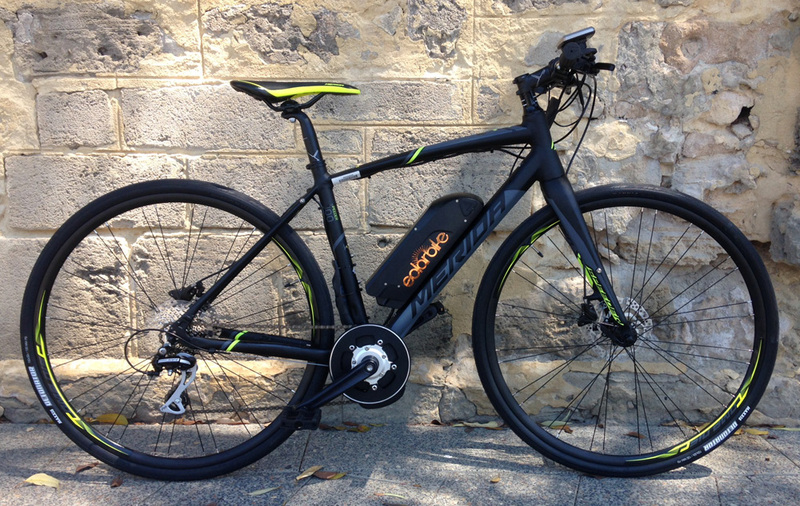 At our store, Perth Electric Biycles, we have a huge range of electric conversion kits you can choose from, so if you are wanting to upgrade the battery or motor, have a chat with our staff. We can walk you through the different option and find what suit you and your needs. The newest Norco Scene makes for a great rear wheel electric conversion. The battery can conveniently go on the down tube which makes for a really well balanced ride, especially running on the large volume tyres. The Scene has a great laid back riding style that suits all, quick trips to the shops, family rides, and taking the little one, the Scene covers it all with ease. 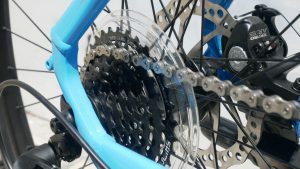 The 1 x 7 drive train makes for simple use as well, allowing a good range of gears to get about and keeping the bars clean and simple. 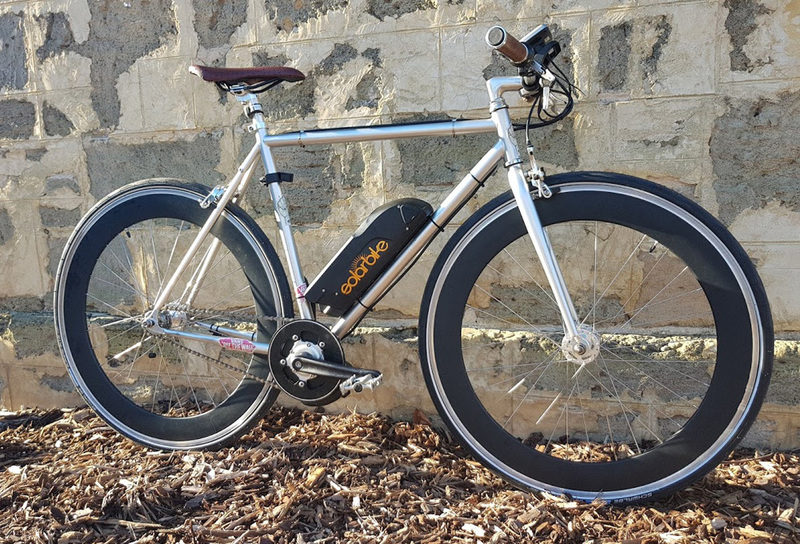 The added electric SOLAR BIKE conversion carry’s on the clean lines and will see you riding around Perth and Fremantle in style with the electric assistance getting you home again against the wind! We’ve just landed another shipment of our summer range of ebikes. Click here to download the catalogue. They include a beastly Fat Bike, a men’s and ladies’ hybrid commuter, a folding bike and a mountain bike. The Lekker Jordaan is a stylish bicycle that we regularly convert in our shop. 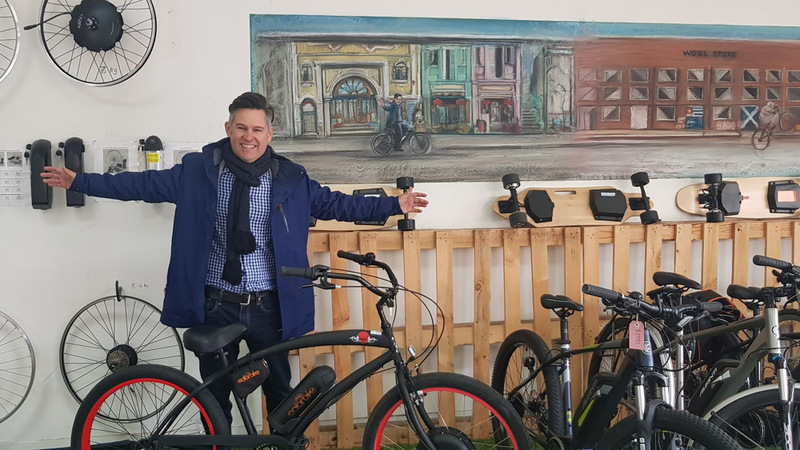 These two lovely models were made electric with our front hub motor and rear rack kit to become some of the most pleasant ebikes to ride and look at. They are well equipped with a Shimano Nexus 7 speed internal hub gear, chain & mud guards, front and back lights and front and back racks. 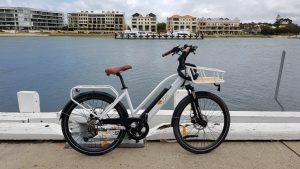 We’re sure these will see many many kilometres of comfortable and elegant electric bike riding around Fremantle and Perth in the years to come. The plant doctor came into the shop recently to get an electric kit for his bike and kindly sent in a review. “So I plumped for your 250W mid drive kit a couple of weeks ago for my Giant CRX. Fairly run-of-the-mill bike modified only with mudguards and kid’s bike seat. 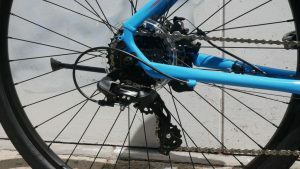 Installation went well, I only needed to re-route the rear derailleur cable as the motor would not clear the cable guide under the bottom bracket. Also added a Rivnut to mount the battery a bit higher up on the down tube. Cables were tidied up using a little tool bag that I had lying around, fitted just between the motor and the battery. 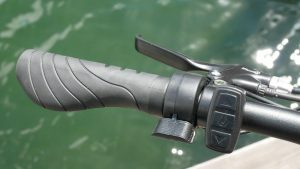 I installed one cut-out brake lever which I find useful to hold on to while gently resting my foot on the pedals say at an intersection – avoids “riding the clutch”. 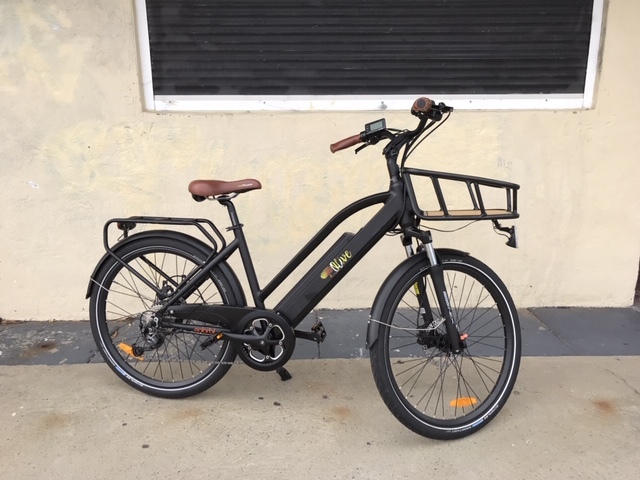 Overall I am happy with the conversion – being all in black it looks quite subtle and it’s a relatively cheap way of going electric. Performance is pretty impressive. I went with the 36V 11.6 Ah battery and I can easily get 50 km out of it, without trying to be economical either, using “Speed” setting pretty much the whole time. I removed the 25 km/h restriction, which is ridiculously low, and upped it to 350W output (don’t let Nanny know). I love the feedback you get from the torque sensing, and how it works efficiently with the gears. Gives a really natural feel. I almost never use the throttle except to have a play from time to time. I can now ride my daughter to school and then on to work, barely breaking a sweat. So far I have done just under 200 km. 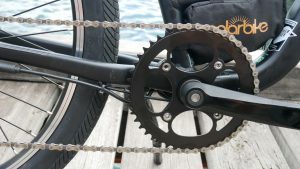 At some point I managed to damage my chain (bent link), not sure what caused that – could have been pre-existing weakness – but I just swapped it out for a KMC Missing Link, problem solved. I guess it reflects the extra stress the chain is under (and this is on an 8-speed, so nothing too flimsy). As a bonus I discovered I can charge my front light with the USB port on the display. I am tempted to convert my other bike too, but then I might get a bit tubby with the reduced exercise! I am considering upgrading the brakes and maybe a larger chainring in time. And maybe a couple more rivnuts to the top tube so I can mount a bottle cage there. But so far I am very happy with it and I’m looking forward to many more easy kms. 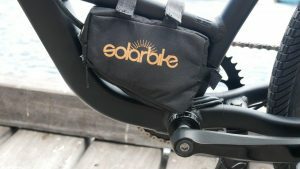 Happy to spread the Solarbike word far and wide! It’s surprising to learn that Australia as a nation currently only recycles approximately 2-3% of its lithium ion batteries and these are now by far the most common type of battery in use. Why may you ask is it so small when they are so expensive to produce and when we are living in a world where every second headline is concerning global warming, turtles dying of plastic strangulation and tips on how to be a 1st class citizen eco-warrior? Well, there is some good news and some bad news. The good news is that recently Australia opened its first lithium ion battery recycling facility but the bad news is that we really just don’t know if it’s financially or energetically worth it. 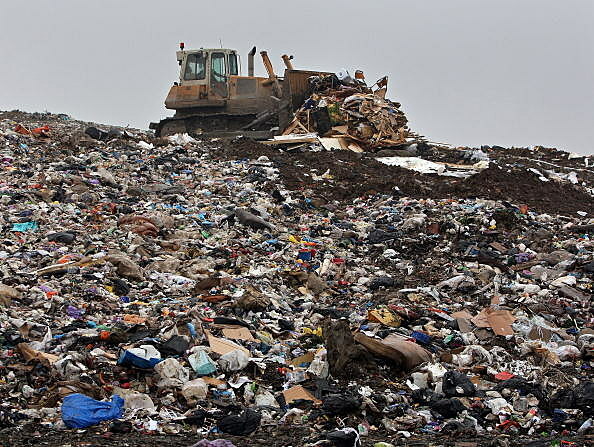 Strange isn’t it – how can it not be worth recycling them? Well, it’s a very complicated topic and after reading a rather complicated thesis about it I’m still a bit confused but the main points are that the processing technology is very energy intensive and produces its own waste. Recycling is largely driven by financial profits and whilst it is possible to recover copper, nickel, aluminium, lithium, steel, cobalt and manganese from some of these batteries, the only ones really worth recovering financially are cobalt and copper; the remaining metals are recovered either due to ease of processing or due to legal requirements. It’s pleasing to see that we are building more recycling facilities and now have a recycling capacity in Australia but it also appears that the design of batteries doesn’t need to focus solely on higher power to weight density but needs to focus also on ease of material recovery. The new lithium ion battery recycling plant in Australia that has been operating for about a year now is called Envirostream, it extracts steel, copper, aluminium and a mixed metal compound that contains lithium, manganese, cobalt, nickel and graphene. The raw materials can go back into Australian industries but the mixed powder is shipped back to Korea where it is used as stock for new batteries. The process used in Australia eliminates the high energy steps of heating to extract all of the expensive metals but rather uses a combination of crushing and pneumatic stress to recover the compounds, this allows for recovery of 95% of the products – with the exception being the plastic polymers used to hold the batteries together. By creating a mixed powder that can go back to the battery factories there is a large processing requirement removed. The leaders at Envirostream have created the powder product based on what is required at a battery factory. When batteries are made, the crafty metallurgists make a cauldron of metallic slurry that is rolled into the anode and cathode. These sheets are cut to requirements needed for battery cells and the left overs are chopped up and put back into the mix. By imitating this mix with the recycled product it is possible to recycle old batteries without needing to take each metal back to its elemental ingot form and save a lot of processing expense and energy. Click here for the most comprehensive read on recycling technology, difficulties and the industry worldwide. To recycle your batteries you can drop them off at one of these recycling centres and they should ultimately find their way back into your batteries in a few years time. Neat isn’t it? 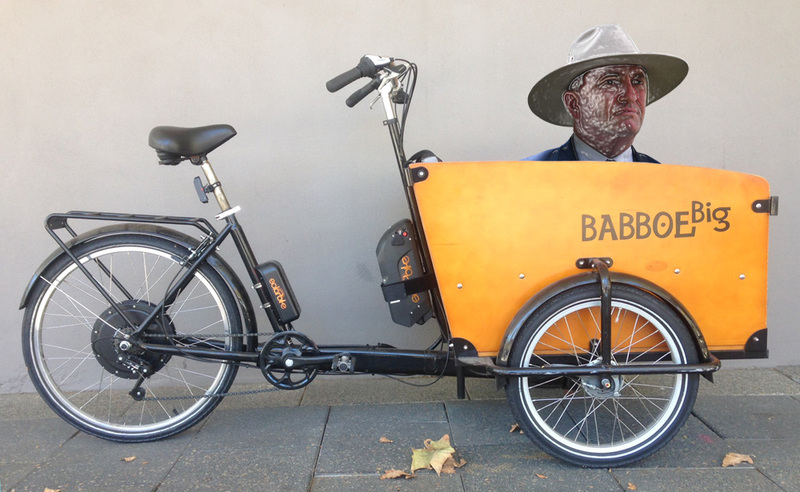 The Big Babboe is a wonderful cargo bike brought into the country by Cargo Cycles in Melbourne. 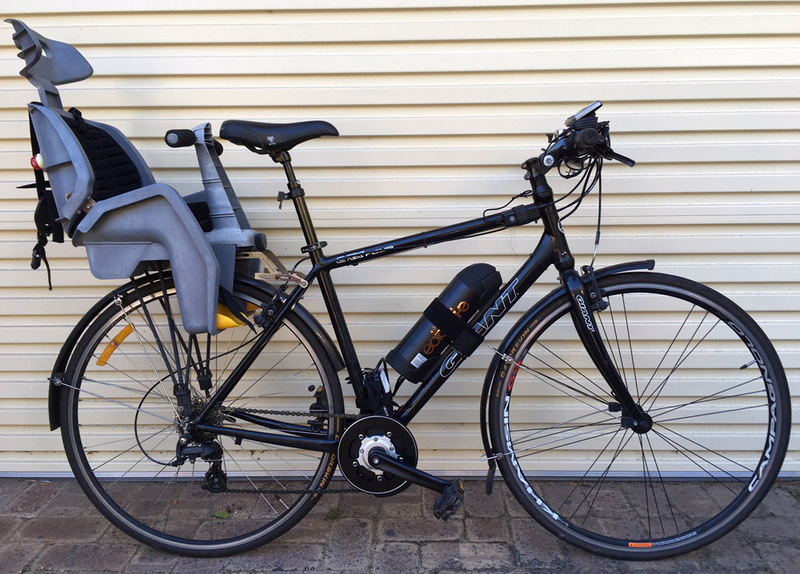 It’s the perfect bike if you’re thinking of starting up a family or already have a large one. We’ve electrified this one with one of our conversion kits to make it all that much easier to ride. If you’ve lost your job and need to down-size to one car or if the daily stresses are getting too much and you’d prefer a ride to work then it’s worth giving a little consideration to this model. It’s getting more and more common these days for someone wanting to quit their oil and gas job, leave their life, sell their car and take off on an eco-powered adventure. More often than not the contraption they build is a hideous monstrosity that needs an over-size load vehicle running ahead of it and isn’t fit for purpose. This isn’t the case with Peter’s recumbent trike or life. I think that he’s nearly got it right. He’s used a well priced recumbent trike from Greenspeed and had us put on a Bafang mid-drive motor up front. A large capacity 48V 17.5Ah battery was located on the frame in front of the seat for a nice centre of gravity. 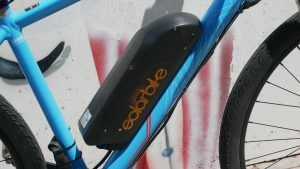 The solar power system includes a 180W panel that feeds directly into the electric bike battery through a $50 multi-voltage solar controller. 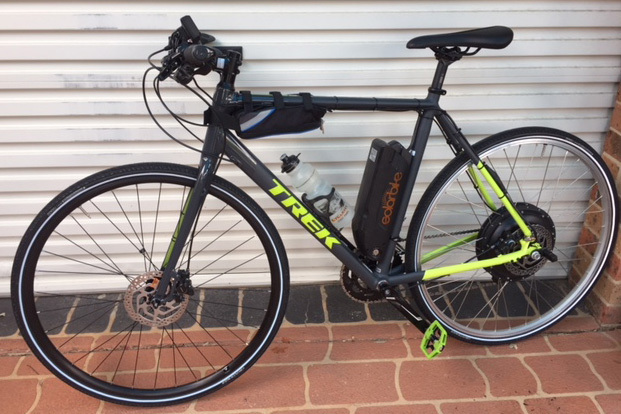 It’s still a work in progress and various test rides are necessary before he takes on the Nullarbor but it’s a comfy and functional system that allows some long-distance eco-touring. With this system alone Peter is able to do about 200km with a battery charge supplemented with solar. He’d have to allow for a few hours of sunshine at the end of the day to reach the goal of being energy neutral by the time the sun sets but he’s not too far off with this simple system. 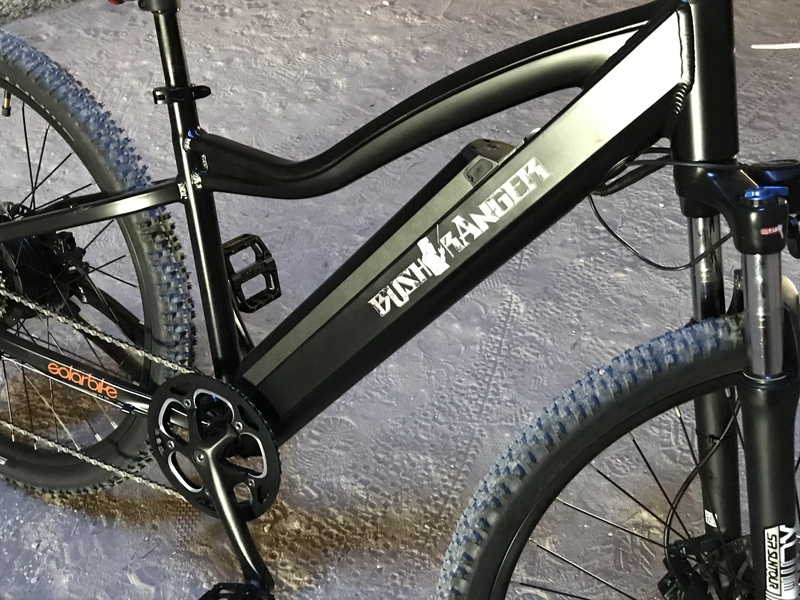 Why would anyone chose to convert a BMX into a tricycle and why they would then want to make it electric is beyond us but we are not here to question; we just electrify as instructed. 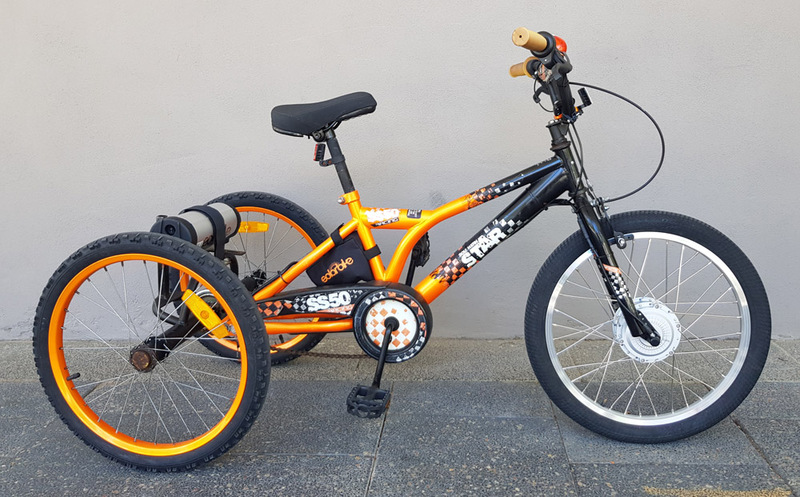 We have no idea where you can pick up a rear end tricycle conversion kit for a BMX but it seems they are out there. 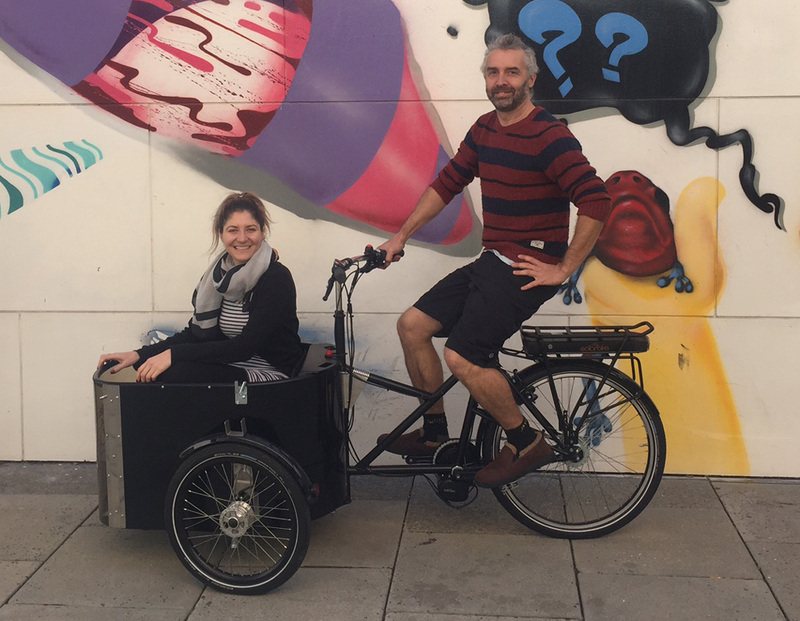 The DOUZE sits at the top of the list of elite cargo bikes. It rides nearly just like a regular bike in terms of performance even though it has an extremely long wheel base to accommodate children. The one problem though is weight when it’s loaded up with two kids and shopping. The obvious solution is to bring it to us to deck out with a conversion kit. 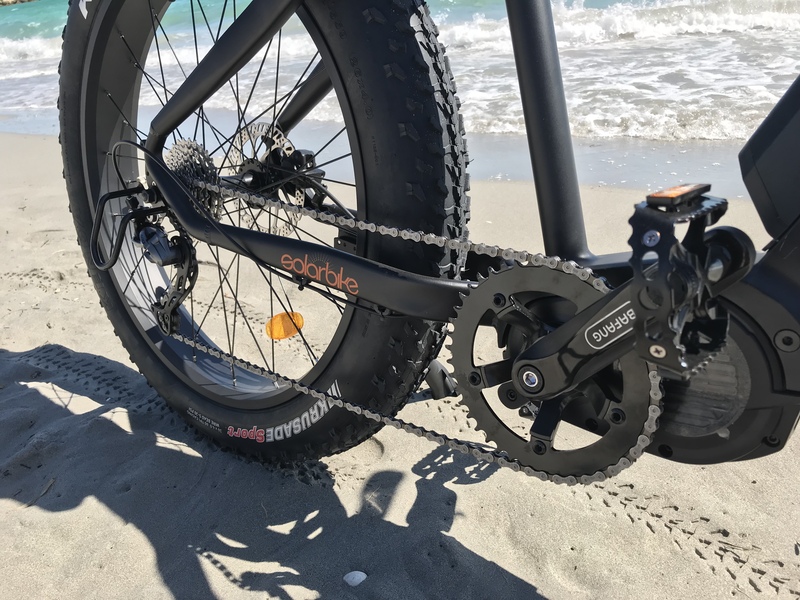 Hub drives are no good as it has a rear Nuvinci gear system that you certainly don’t want to lose and the front wheel has a through axle that isn’t compatible with a hub motor. Next we tried our own mini-motor but that wouldn’t fit either due to the frame geometry. The only solution we could find was a BAFANG BBS02 motor, and even then we had to pull the motor apart and mount the halves around the frame. This motor mounts centrally in the crank. 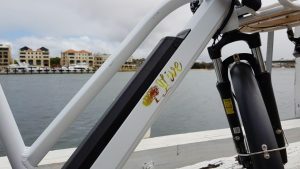 The hassle was worth the reward as the final product is perhaps the most perfect mode of transport for those with children wanting to ride instead of drive – and can afford it! 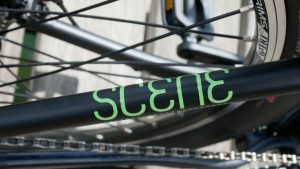 The Scene is a cracking new bike that has come out this year from NORCO. It’s a strange combination of cruiser, upright, step-through, mountain bike and laid-back riding. This is one extremely comfortable bike that is designed with performance and comfort in mind. It is a completely magic model for use with our electric bike conversion kits. This one here has been decked out with the PANASONIC 36V 14Ah tiger shark battery on the down tube and a rear hub motor; with internal routing of all cables it looks as if it’s come straight out of NORCO’s factory like this. 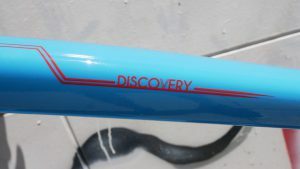 The bike comes out in two models and three colours. 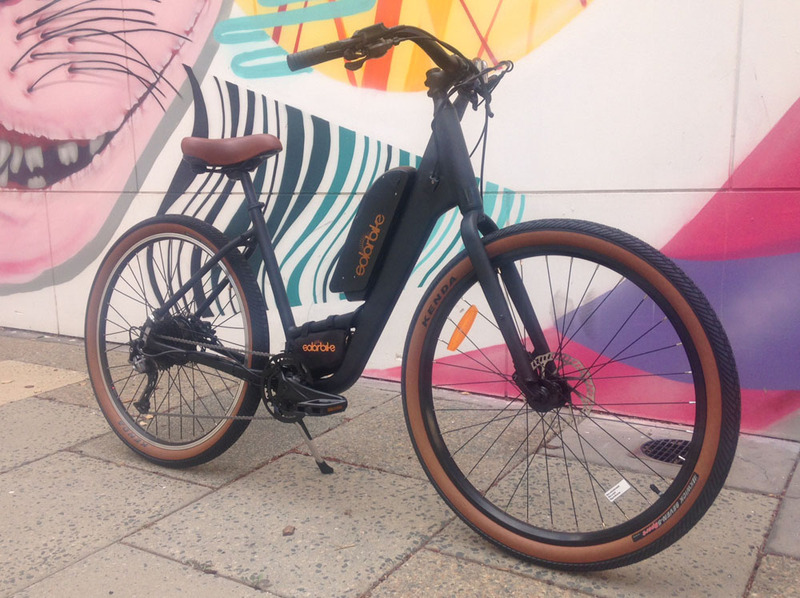 The Scene 1 is the more upmarket version that retails for $850 and has a black frame, hydraulic disc brakes and a 9 speed Alivio gear set. The Scene 3 is available in grey/white and raspberry, retails for $650 and has a 7 speed gear set and cable disc brakes instead. Both are ideal bikes for electric conversion. Please come in to test ride this bike if you think it may be up your alley. The performance is brilliant and with the rear hub motor, throttle and centrally mounted battery it’s hard to beat for the price. 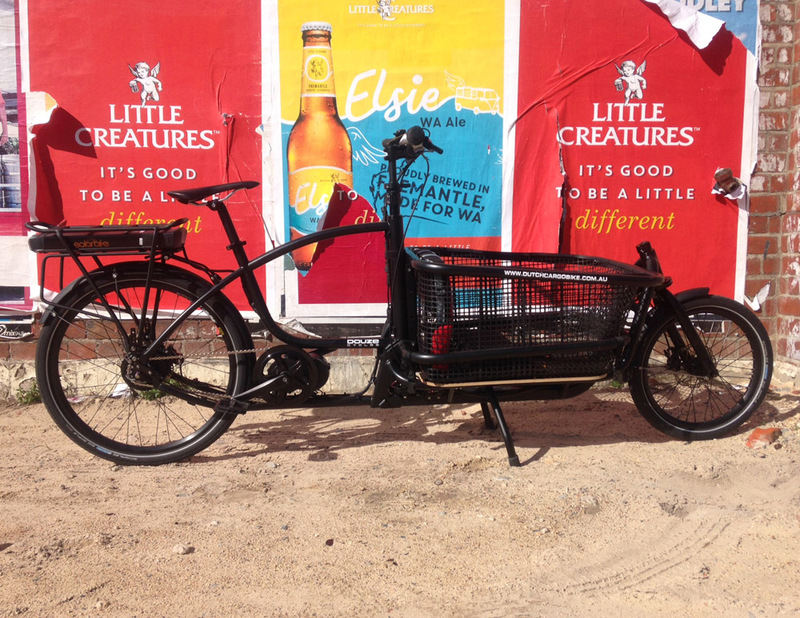 This is the GR8 from WORKCYCLES, imported by Dutch Cargo Bike and also sold locally in Perth. 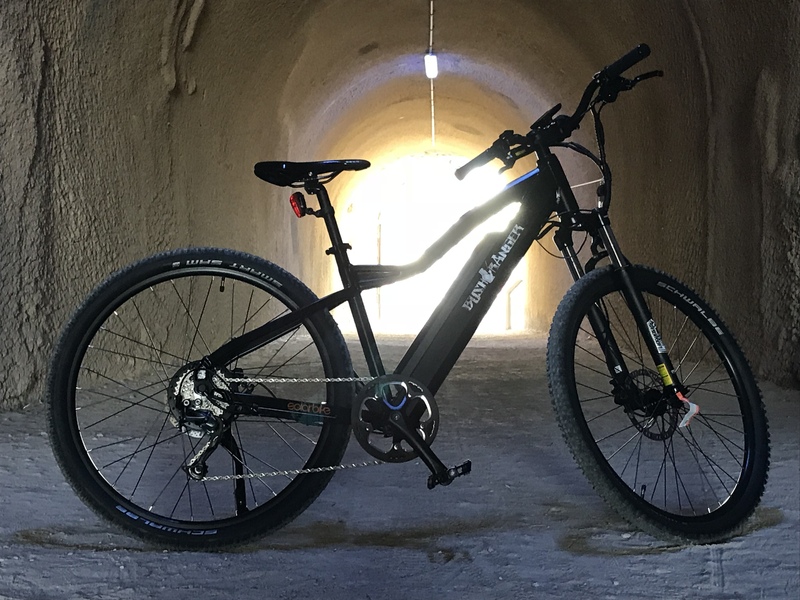 It’s very hard to see now but it’s been electrified with our mid-drive kit and PANASONIC 14Ah lithum ion battery, it just fits behind the seat tube. The bike is a superb bike for carrying loads up to 200kg and also for carrying kids. They have plenty of accessories to deck it out so a kid can sit on the front as is shown here or else on the rear heavy duty carry rack. The short wheel base and nice fat 26″ tyres make it very maneuverable around town. The conversion kit went on pretty easily, the only bit that required a fair bit of fiddling around was to get the original chain cover to go over the motor. Had to be spaced out and a few crafty cuts made here and there. All up, it’s one of the best electric cargo bikes we’ve come by. When Bikies ride tricycles this is what they ride. This one was brought in by a couple of bikies after allegedly purchasing from “The Chinese government”. One of them had lost the use of his legs through a suspected motorcycle accident. They paid $1000 for the trike and $600 for delivery but when it arrived nothing worked except the battery. We laced a 1000W motor into the existing rim and it’s up and running. Pretty heavy on the steering, sloppy suspension and useless brakes but it certainly motors along! The three wheeled cargo bike from the famous Danish company NIHOLA is arguably the best in the world of its kind. 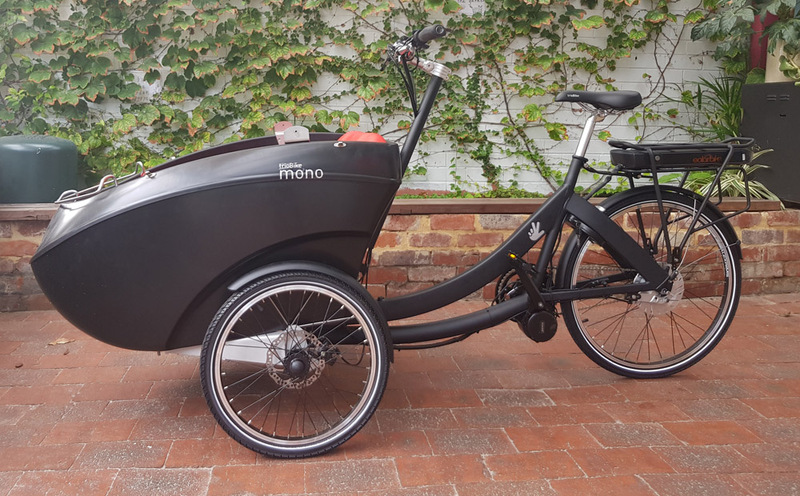 It’s great that they are being imported locally into Perth by the company “Dutch Cargo Bike” because they really have some features that are well advanced in comparison to other models. The have a lovely deep cabin floor that is low for extra stability. In combination they have their own steering system so that the wheels move independently of the frame. It makes this bike very stable and it’s a lovely smooth ride. This is great for picking up the kids, the shopping or anything else. It comes together a treat with our own mid-drive torque sensing conversion kit. It’s a little on the heavy side to ride without power assist but it’s simply beautiful and practical with a small electric motor installed!